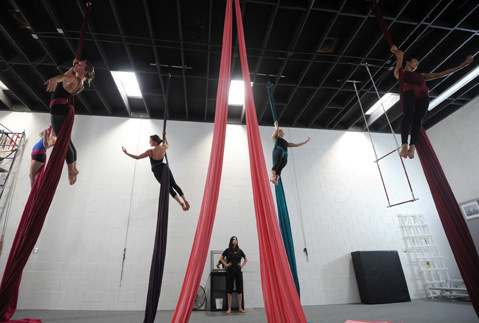 <b>HIGH CLASS:</b> SBCAA owner Ninette Paloma supervises a group of advanced aerialists. For Ninette Paloma, dance is a family affair. The tightrope-walker-turned-trapeze-artist has been teaching aerial dance in Santa Barbara for 12 years, and fostering a love of flight in students of all ages. From private classes held in an artist’s loft to the city’s first dedicated aerial arts studio in a Quonset hut on Milpas, Paloma has sought out ever-larger spaces to accommodate her students. In 2011, she expanded her company La Petite Chouette (“The Little Owl,” in French) to become the Santa Barbara Centre for Aerial Arts, now a three-studio space located at 810 East Gutierrez Street, Suite B. This Sunday, December 8, she offers a behind-the-scenes peek at her ever-growing aerial dance family. Once inside, the family feeling of this training center is apparent, from the cubbies where dancers store their bags to the way company members move through the space, relaxed and assured. This year, six never-before-seen aerial dances will be unveiled in three studios over the course of two hours; a $40 ticket grants entry to all of them if you show up right at noon, although guests are welcome to drop in anytime noon-2 p.m. As usual, there will be wine and nibbles. On the program for Sunday is a collaboration between Toad the Wet Sprocket frontman Glen Phillips and his daughter Sophia, an award-winning aerial artist and longtime member of Paloma’s cadre. There’s also a solo for fabric sling that will travel to New York in early February, a playful tightwire duet, an abstract trio on trapeze, and a work performed on the cloud swing — an old-world circus apparatus that Paloma transforms into something much more modern. All proceeds from Entrée des Artistes ticket sales will go to Paloma’s latest venture, and perhaps her most ambitious yet: the city’s first-ever aerial dance festival, scheduled for this coming February. As part of the 2014 Santa Barbara Contemporary Floor to Air Festival, aerial artists will travel to town from France, Portugal, Costa Rica, New York, and Colorado to share techniques and inspiration, learn from one another, and teach workshops to students of all levels. The weeklong festival will culminate in Belline, a public performance on Saturday, March 1, at the newly restored Lobero Theatre featuring international aerial collaborations. Growth and expansion have always been part of Paloma’s vision, yet the familial quality of her studio and company remains central. “It’s all about coming together to nurture each other, whether you’re grooming your wings for the first time or developing your voice as a seasoned aerial artist,” she explained. For info about Entrée des Artistes, call (805) 284-8785 or visit sbaerial.com.